The world-famous cheesemakers from Marieke Gouda in Thorp came away from a competition in Titletown last month with a pair of new titles. The judges at the U.S. Championship Cheese Contest in Green Bay chose Marieke Gouda varieties as the second- and third-best cheeses in the nation. With a score of 98.419 out of a possible 100 points, Marieke Gouda Premium was edged out of the grand champion spot by less than two-tenths of a point by a baby Swiss created by Guggisberg Cheese of Millersburg, Ohio. Meanwhile, Marieke Gouda Overjarige – a variety aged more than 24 months – was second runner-up with 98.39 points. “OH MY GOUDA!” the cheesemakers proclaimed on their Facebook page, where they also acknowledged that attention generated by the contest had left them flooded with more than 900 online orders – more than they typically get during the Christmas season! Marieke Gouda is crafted by Marieke Penterman, her family, and employees at a farmstead cheese operation just off Highway 29 in Thorp. The Pentermans are immigrants from Holland who came to Wisconsin to farm and ended up striking gold in the cheese business. 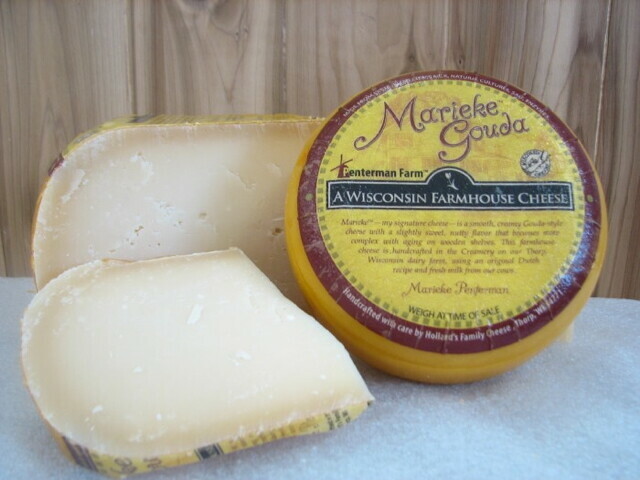 In 2013, Marieke Gouda was named U.S. Champion at the national contest, which is held every two years in Green Bay. One of their cheeses was also second runner-up two years ago. For more word on the curd, visit mariekegouda.com.